You’re just scared of a little competish. Last Saturday, the Manhattan Plaza Health Club (MPHC) hosted a bouldering competition, “Empire State of Mind”. Two weeks ago, Sarah Knapp from OutdoorFest contacted Flash Foxy about the competition letting us know that no women had yet entered. I, as well as several of the other girls, were either out of town or had other plans, but we all spread the word to other ladies in the city. It wasn’t until later that I started wondering why the women’s category had remained empty so close to the competition date. It wasn’t for lack of promotion – there were men entered. It couldn’t be for lack of ability – there are dozens of girls climbing hard problems every time I’m at the gym. I was curious if it might be something more. When I began climbing, it was solely with my boyfriend. We climbed in the gym, received guidance in trad climbing, and learned to lead together. Unlike some other sports, climbing truly leveled the playing field. Men had the advantage of natural upper body strength and typically longer reach. Women usually have less weight to carry and tend to have better technique that relies more on footwork and flexibility. There are dozens of pros and cons of having a male body versus a female body as a climbing athlete, but all in all it seemed to even out. As we made friends though climbing, they tended to all be male. Part of it was because there are just more guys that climb and part of it was because I’ve always had mostly male friends. While my male climbing partners have always been supportive and encouraging, if I couldn’t send a climb I sometimes chalked it up in the back of my head to having a shorter reach or less upper body strength. I was challenged by climbing with guys, but didn’t feel like I had to size myself up against them. Then I met Kathy. Kathy Karlo is a crusher. She is about my height and build but rather than excelling at only delicate face or balance-y moves, she seems to thrive on climbs that require brute upper body and grip strength. All of a sudden any excuse I had for not doing a climb boiled down to just that – an excuse. Seeing Kathy cruise climbs that I struggled with was hard at first since I was no longer the ‘only girl’ in my climbing world. I realized that I viewed her as competition but I wasn’t sure why, especially since I didn’t feel this way about my male climbing partners. Why did it matter to me that she could climb harder? As I got to know her better it became easier to view her in the same way as the guys. She lent me her ice axes to use for my first ice climb. I could use her beta (same height), assuming I was strong enough to do the move. Seeing her progress up grades showed me what was possible and gave me incentive to work harder. There were still difficult moments, like when I backed off a Gunks 5.3, ‘In the Silly’, as a beginning trad leader while Kathy sent a 5.9, ‘Bonnie’s Roof’, nearby. But in the end it forced me to confront my naturally competitive side and focus on progression within myself. 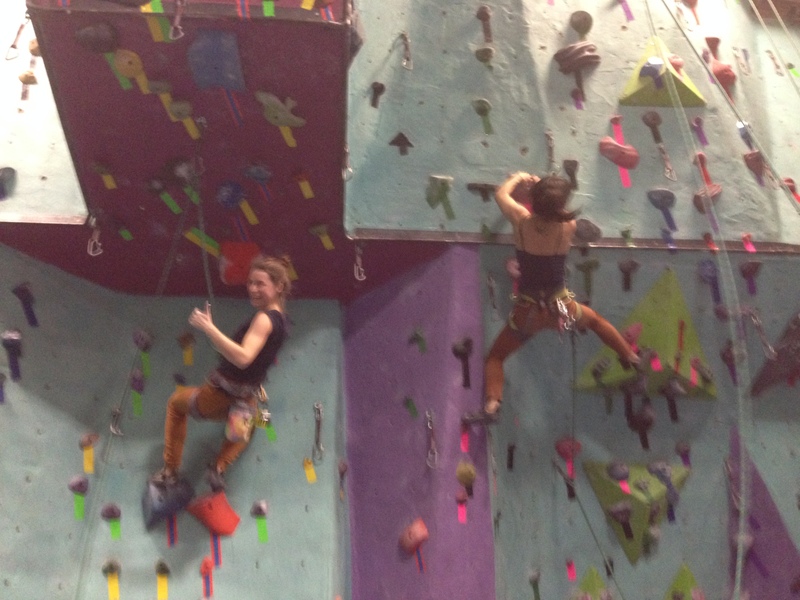 Caitlin & Kathy climbing in sync in matching outfits at BKB. (you can’t plan these kinds of things)! As time went on I began to meet and climb with more women — Nina, Jackie, Rana, Shelma, Kelly, Rachel, Jill, Lindsay, Taylor, and Lauren all became people I’d look forward to seeing at the gym and outdoors. 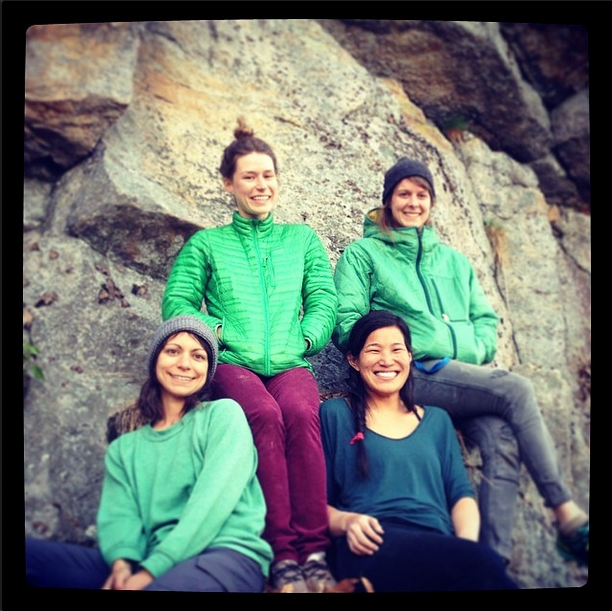 As much as I love seeing and climbing with these girls, I still value my male friends in climbing…to such an extent that I wasn’t sure I was really on board with the idea of Flash Foxy at first. Since I grew up running with the guys, it was hard for me to see the point of excluding 50% of my climbing friends. I feared that creating something meant primarily for women would further separate us from seeing ourselves as people that can, and should, climb as hard as the guys. However, thinking about competition and dealing with my initial insecurities toward Kathy made me realize I hadn’t been viewing men and women climbers as being truly equal. It occurred to me that sometimes it does help to see someone a little more like you pushing her limits. 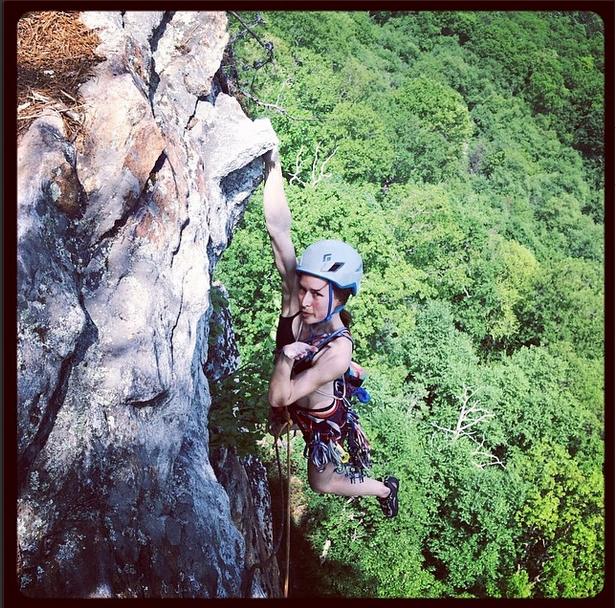 Maybe having a female-oriented site will encourage other women to try climbing or push their limits a little farther, the way climbing with Kathy did for me. I believe some women did end up competing and that’s awesome! But I’m still not sure why there initially was not any women entered in the boulder comp. It may simply be a lack of desire to compete on any official level, rather than a complex about measuring up to their fellow woman. Whatever the case, “Empire State of Mind” got me thinking about the nature of competition and why I was inherently more competitive with my female climbing partners. It also made me recognize how I’ve become less intimidated by strong women climbers, which came from checking my ego and enjoying the climb and company. Caitlin I’m from New England but have lived in Brooklyn since 2003. I’ve been climbing since 2011 and love it all – trad, sport, ice, alpine… maybe not bouldering so much 😉 I’m learning to aid this year to get up on some big walls! I’m a women’s clothing designer and love to sew. I make my own clothes when I have time – which isn’t often since my climbing addiction began. Hey climber babes, just wanted to let you know that you’re on my top 5 Instagram accounts to follow for this week. Keep up the badassery! Good article and food for thought! I always wish I had more girls to climb with in the gym!